Whenever we are talking about face make up, Eye makeup is very important, Today i am going to share some important tricks which will definitely help your eyes to look really beautiful and attractive. 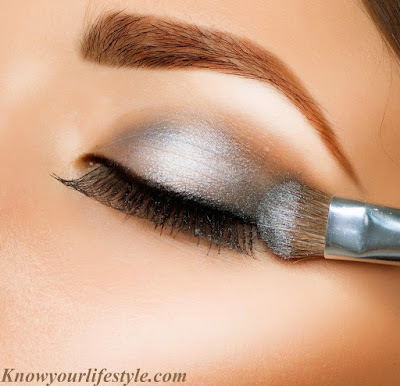 With these tricks you will come to know how to apply makeup on your eyes. If you want your eye makeup should remain as it is for the whole day then its very much important that you should apply makeup on your eyes carefully and correctly. Before applying makeup on eyes, its always recommended to choose best eyeshadows for eyes as our eyes are most sensitive part on our body. I am going to discuss best eyeshadow which is highly recommended and lasts whole day. Good Quality Eyeshadow Primer is always advisable which will effective while you are sweating, or if you have oily skin etc. "Urban Decay Eyeshadow primer Potion" is good quality Eyeshdaow primer you can for. you can find it on www.ulta.com or Amazon.com. These days variety of eyeshadows are available in the Market. Many of them are not even capable to stick on our eye lids, if anyhow they manage to stick, after few hours you cannot find them on your lids, they will disappear. Eyes shadow with a great pigmentation is always wonderful. You can also go for Quality eyeshadows from drugstores too. On the inner side of eyelid, give light color stroke in the corner. It will help you to brighten your eyes but never use it most obvious. Your first task is to coverup whole dark area near your eyes. You can apply Concealer on dark areas with the help of Concealer brush or tip of finger to cover up under eye circles, blemishes etc. If fortunately you are not facing any dark ares, under eyeliners or blemishing problem then directly jump to second step. Under each eye you can apply 3 or 4 dots of concealer. You can start apply concealer from the inner corner of eye as normally we find darkest skin there, after that under pupil and lastly on the outer corner of eye. Appy concealer with your ring finger is never advisable as it assumes its pad is very soft. Rub Concealer till the time its not mix with skin. Primer will always help eyeshadow to keep on eyes for a long time. apply Primer on eyelids and it will provide base for eyeshadow to keep on eyes during working hours, Party Nights, meetings or even at sleep. As we all know that before painting any wall primer is compulsory as its a base for paint on wall similarly Primer on Eyelids is must. Normally if we are going in casuals, we never bother to apply liner on eyes but remember eyes which are lined nicely always looks beautiful. Eye liner always highlight eyes and if you have applied liner correctly on your eyes then anyone can attract to your eyes. Liners are of two types Liquids and pencil. you can use either but if you want to use any dark eyeshadow in place of eyeliner you can go for it.User eye liner on the upper side of eye lashes very closely and apply it from inner corner of eye towards outer corner. You can do the same to the bottom eyes. Why Eyeshadow is important because it helps you be look your eyes attractive and all veins over lids will cover with it.if you are going outside in day timings always use shadow which is light and basic. Stila's iconic Kitten eye shadow is a quality, Easy to apply, last long and you can use it either wet or dry. I have seen many beauticians and celebrities using it.If you want to go for more then you can use eyeshadow which is tree toned and using to eyebrows from eyelids. Like rainbow blend them in each other. According to "Mally Roncal"(Celebrity Makeup Artist), you should always use light eyeshadow in starting which should match you eyelid and then use medium color which you can spread over the eyelid up to bone of eyebrow and on boundary area of eye always use dark color eyeshadows and mix all colors perfectly. Now you will come to know how to highlight the inner side of eye. Once you will apply light eyeshadow little bit inside of eye on corner, you will see your eyes will shine and look bright. You need to use the same light Eyeshadow and apply it on your eyebrow. Always concentrate on middle of your eyebrow and outside of your eyebrow. With the help of your finger tip can spread it. If you want to look your eyes attractive, you can use eyelash curler which will help you to make your eyelashes longer. To add more effects into it, Under blow drayer for few seconds heat eyelash curler. I recommend to check curler before using it on your lashes because if it will too hot, it can burn your lashes. Always apply good quality mascara. With the help of Mascara brush apply from bottom of eyelashes and twist backward and forward. Same way you can apply Mascara to bottom eyelashes as well.